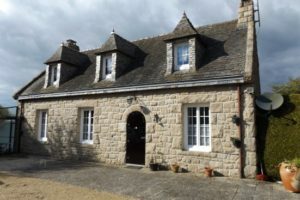 This stone longère offers a large living/diner with featured fireplace with log burner, large eat-in kitchen, large double bedroom with en-suite bathroom, with an additional bedroom and en-suite bathroom to finish. The property sits on approximately 1654 m2 of land with stunning views of the countryside. 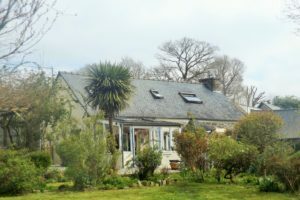 The main house has a fully fitted kitchen with dining area leading to large living room with featured Breton Granite Fireplace and wood burner. Entrance hall with staircase leading to bedroom, and bathroom, laundry Additional staircase off living room leads to the additional two bedrooms and handy WC. The second house has a large, well-equipped kitchen, a separate living room with wood burner, laundry room. Upstairs, 2 double bedrooms and bathroom. This beautiful 4 bedroom 2 bath property faces south, and sits at an end of a private drive with parking for several cars. 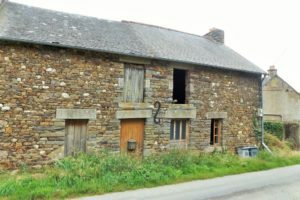 The property is approximately a 5-10 minute walk to the village of La Chapelle Neuve, the village has a butcher, bakery, grocery shop and bar. 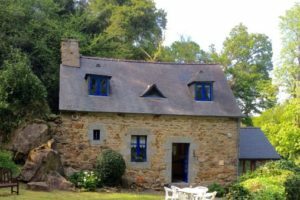 Located on the edge of village of Brelidy 22140, in the heart of Brittany, close to the beautiful coastline of the Côtes d'Armor, lies this charming, secluded, 19th-century stone cottage. The cottage sits on three quarters of an acre of meadowland, bounded by a quiet stream, built around a rustic log fire, and is nonetheless fully equipped with up-to-date furnishings, and only a short drive from nearby villages, shops and towns. The cottage consists of 3 double bedrooms, one on the ground floor with en-suite shower room. A fully fitted kitchen with Up-to-date oven and hob, washing machine, microwave: everything you need to cook à la Français. Living room/diner with featured granite stone fireplace with wood burner. On the first floor are the two additional double bedrooms with bathroom. 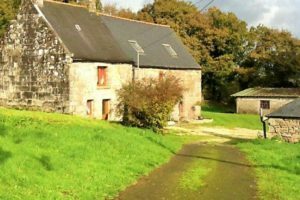 The property is in a rural setting and invites those who like to spend lazy days with only birdsong and a rippling stream for company. Eat al fresco on the lawn, or wander through the meadow and trees down to the stream. This is a well maintained stone built, 1 bedroom longère plus mezzanine, and 1 bedroom cabin ready for you. Very private sits on approximately 1640 m2 land mainly laid to lawn, with mature shrubs and trees, the main garden to the property is fully fenced and private, with section for vegetable garden. Large gravelled terrace with pergola with abundance of roses giving you a fantastic area for entertaining, or just sit and enjoy the peace with great views to the surrounding countryside. To the rear of the house there is ample parking, polytunnel, and two sheds and area for wood storage. 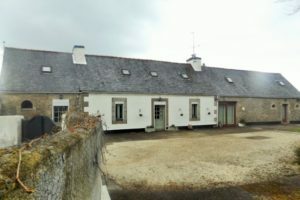 This home is situated in central Brittany, in the Cotes D'Armor area 22, Peumerit-Quintin. Upstairs there is another large bedroom with WC/Sink. A wonderful Kitchen/Dinner with sitting area with Rayburn stove with plenty of cabinets and work surfaces. The high ceilings and exposed beams give this upper floor lots of light and character. From the dining area there is a sunken living room currently been used as bedroom, From the kitchen there is a wonderful covered deck that runs the whole length of the house and a Gazebo, great for BBQ's and outside dining. 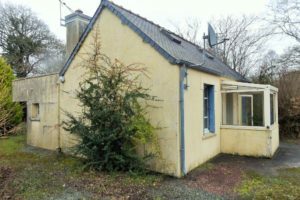 This property also includes a separate cottage that is partial renovated just needs some TLC. Kitchen, Shower, Living Room with wood-stove, and large bedroom perfect for family and friends coming to stay or additional income if you want. 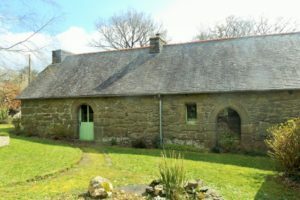 WOW, want a rare find, this lovely two bedroom cottage. In a beautiful setting with manageable garden, stone barn perfect for storage. 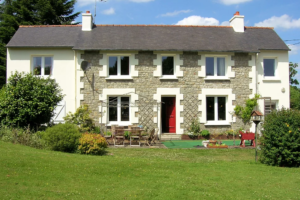 Set back in a quiet hamlet, with beautiful views over undisturbed countryside. Perfect lock up and leave, or permanent home. You enter into the property in to a large kitchen/dinner with stairs to one bedroom. Downstairs bathroom. On the other side there is a large living room area with magnificent stone fireplace, French doors to rear garden. Stairs to additional bedroom. You enter the house through a double glazed porch, which has a ceramic tiled flooring, and two newly fitted PVC doors. From here you enter into an open plan kitchen/diner. It is divided slightly by the breakfast bar, with ceramic tiled flooring, exposed beams, a radiator and a windows to the front with shutters. From the kitchen the door leads into a large room, this would make a great living room with ceramic tiled flooring with French doors leading to the garden. This room also has a ceramic tiled floor, doors leading to the shower room and double bedroom. 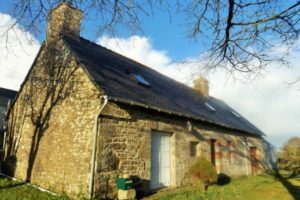 This cottage is extremely low maintenance and a perfect lock up and leave holiday home. Anne MOSS ayant le statut d’agent commercial n° 817 937 543 R.S.A.C. Saint-Brieuc.